MUMBAI: Cartoon Network is sparing no effort in its endeavour to solidify its position as the number one kids channel in the country. It will launch a slew of new shows from this weekend. What should prove tantalising is the amount of variety in the content that has been brought in from the antics of Indian folklore legend Birbal when he was young to the animated spin-off of the Men In Black movie. Adventures of Chota Birbal on Cartoon NetworkOne of the major highlights is the premiere of The Adventures Of Chhota Birbal. Billed as 'the smartest kid from a land of smart kids' the show will air every Saturday at 5:30 pm from 4 October. Produced by Mumbai-based CB Media Ventures, an official release informs that this marks the sixth locally produced acquisition to debut on the channel. Cartoon Network India's executive director strategic marketing Nikhil Mirchandani said, "The compelling programming mix includes the best of Indian and Internationally popular shows/characters like Men In Black, Teletubbies, Stuart Little, Karate Kid, Spiderman. They have been specially put together to ring in the festive season and holidays. The Adventures Of Chhota Birbal is bound to appeal to kids and parents, as the commonality in all episodes is the use of knowledge, wisdom and wit by Chhota Birbal to solve problems. This makes him a 'smart kid' icon." Men In Black also debuts on 4 October at 1:30 pm and airs every Saturday. As with the Will Smith movie the show deals with a secret government organisation that offers inter-galactic immigration services. When aliens commit crimes it is up to the title characters top maintain the peace. After that those interested in Latino heat can tune into Mucha Lucha at 2 pm. The over the top comedy explores the Latino culture. The main themes are family, honour dashed with a healthy sprinkling of doughnuts. Three youngsters live and study the Code of masked Wrestling. As far as the Tiny TV block is concerned the channel will air a special season to coincide with Diwali involving Teletubbies. It will air from 20-24 October at 2 pm. 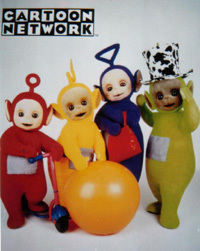 The BBC Worldwide show sees the title characters play in teletubbyland. Fans of the two Stuart Little films are in for a feast in November. 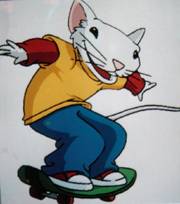 The channel will start airing the animated series Stuart Little from 9 November every Sunday at 2 pm. The show follows the brothers Stuart and George. As with the film George plays big brother to the mouse Stuart. Though he is a mouse Stuart never ceases to surprise with his never say die attitude. The grand finale for the year is Spiderman. This will launch from 15 December. Neil Patrick Harris, Ian Ziering and singer Lisa Loeb lend their voices to the new version of the classic animated series. In India this used to air on Doordarshan. One can expect advanced state of the art computer animation. This year has seen so many releases on Cartoon Network that it is sometimes difficult to keep track of all the titles. Some of them were Sitting Ducks, Baby Looney Tunes, What's New Scooby-Doo, The Adventures of Tenali Raman and Alibaba & Forty Thieves.